1508 is a 47-seater former snack car based in the Society's Dublin fleet. 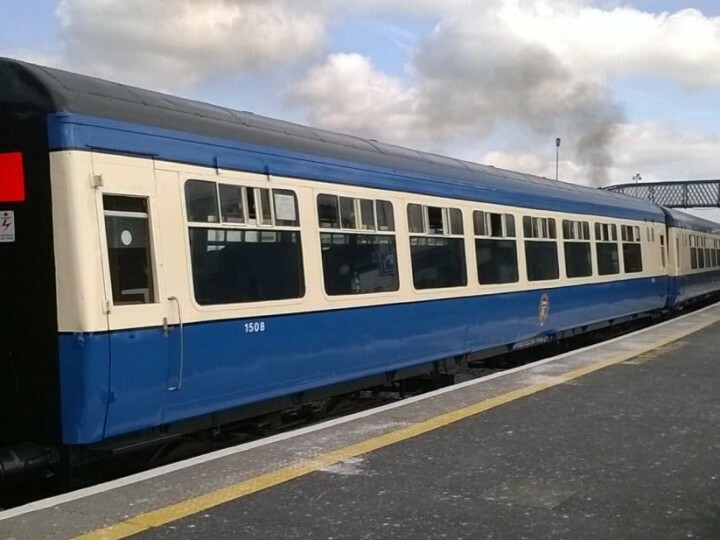 Starting life as 64-seater Open Standard coach, it was part of the first batch of coaches supplied by Cravens of Sheffield to CIÉ in 1963 and delivered to Inchicore substantially complete, unlike later lots. Starting off on premier services, over the decades the Cravens were gradually cascaded down to more menial duties as newer rolling stock took over the top link duties. 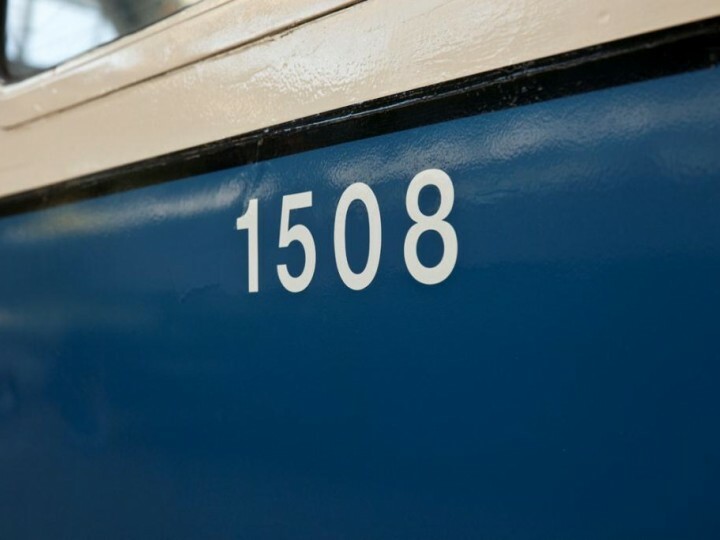 For the first 27 years of existence 1508 was a fairly nondescript coach, no different to any other Craven. However, in 1990, a conversion at Inchicore was to see 1508 become quite distinct from her sisters. 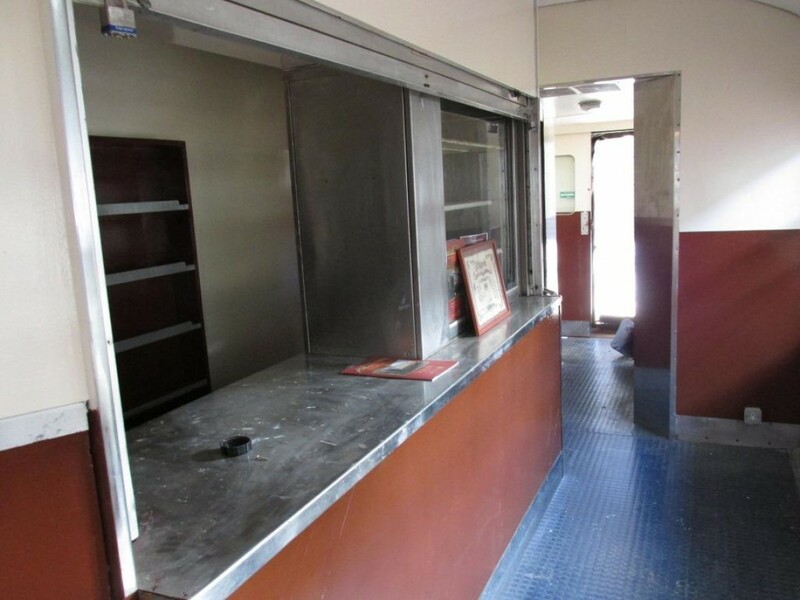 Originally there were no Craven catering vehicles, such facilities would have been provided by one the 1950s built wooden-bodied 24xx diners (of which2421 and 2422 are now preserved by the Society). However, these were gradually withdrawn during the 1980s. 1518 and 1520 were converted to snack cars around 1986. 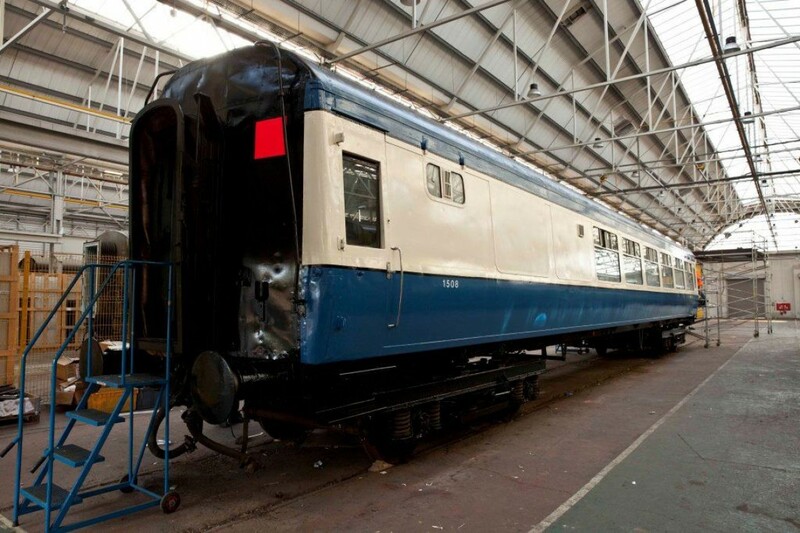 However, they lacked a lock-up facility and were converted back to standard class coaches at the start of the 1990s. In their place 1508 was converted to snack car. A shop (complete with sink, Burco boiler, fridge and shelving) replaced four bays of seating at one end, this time including proper lock-up facilities. Sister vehicle 1509 was converted soon after. 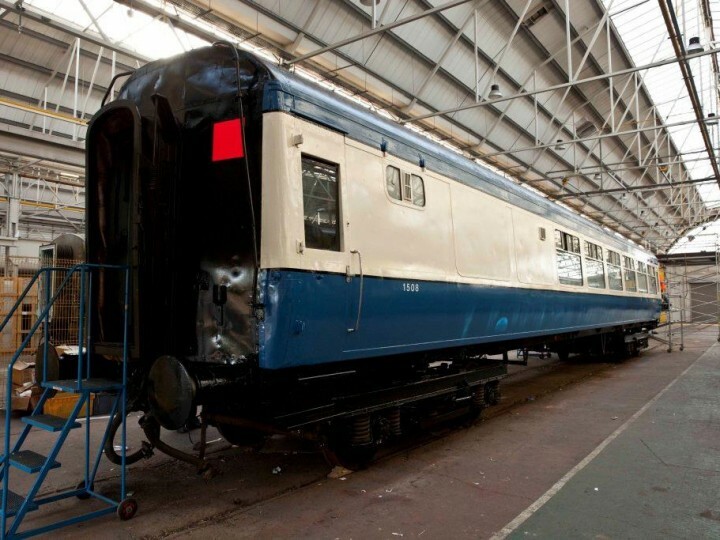 As part of the conversion two windows were plated over, giving these vehicles a rather distinctive appearance from the majority of the fleet. One of 1508's first duties in the new guise was to provide catering on a special to Cork in connection with a Prince concert. Cravens carriages were quite common on GAA and similar specials by this stage, along with Friday Only workings, and 1508 enabled catering facilities on these when they would have otherwise been merely a trolley service. Sadly 1509 did not last long as a snack car, being withdrawn after a derailment in 1993. This left 1508 as the sole Cravens catering vehicle, virtually unique. 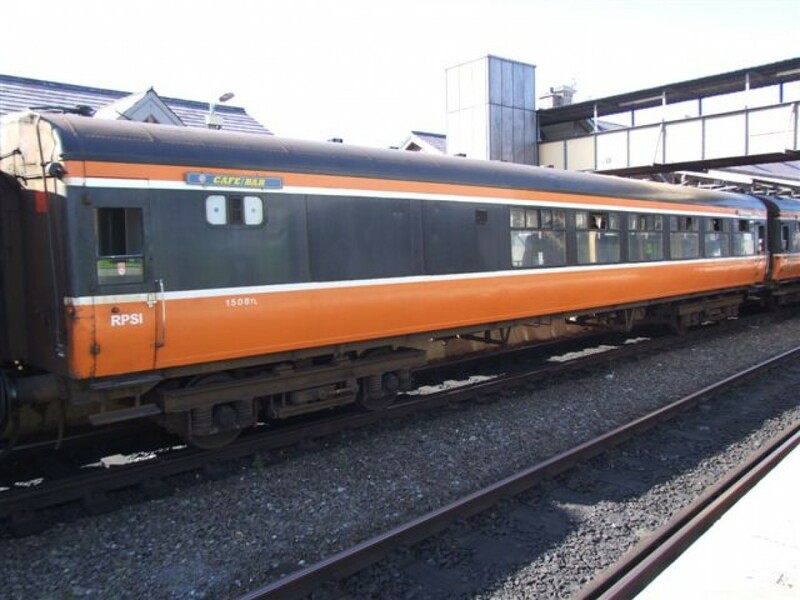 As such, she was much sought after on special trains, including enthusiast specials, which would have seen her visit the entire extant passenger system from Cobh to Portrush, along with freight only lines such as that to Navan. She was virtually a permanent fixture of diesel railtours from the 1990s to the mid-2000s as well as the Society's Three Day International railtour, long before preservation. In 2006 Iarnród Éireann gradually withdrew the Cravens fleet. 1508's last duty in IÉ ownership was on "The Boat Train", a special railtour on 25th November 2006 - an appropriate finale for a vehicle long associated with enthusiast specials! Of course, this was not really the end. 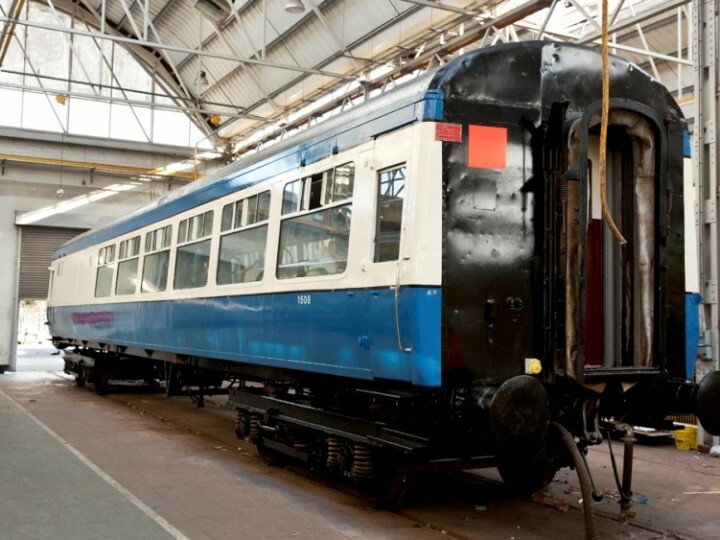 As the only surviving Cravens catering vehicle, 1508 was a shoe-in when it came to the RPSI selecting examples for preservation, and passed into the Society's care in 2007. As the renovation of a Cravens vehicle as a bar car was then some years in the future, she had her Cork end bays removed in 2008 and a temporary bar installed entering RPSI service on the "Dundalk 50" operation on 28th September 2008. The refurbishment of former Open Standard 1522 as a kitchen car meant that the snack shop found a new role selling souvenirs to passengers. 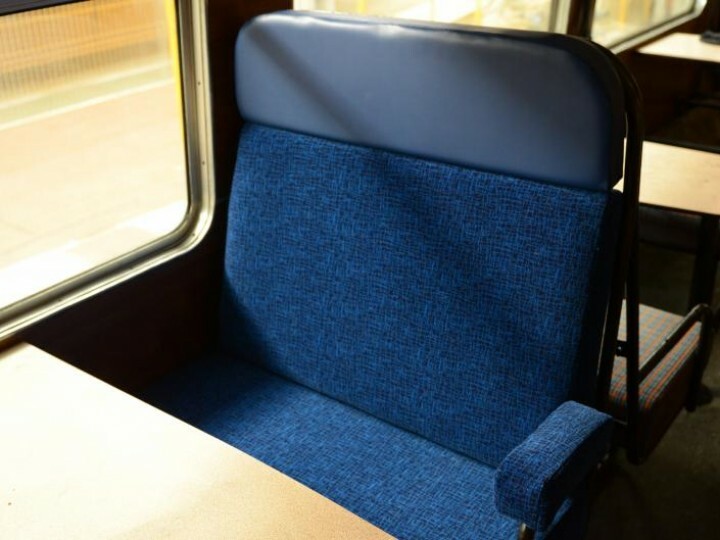 In 2011 the temporary bar was removed, and seating reinstalled, after the renovation of former Open Standard 1514 as a bar car. 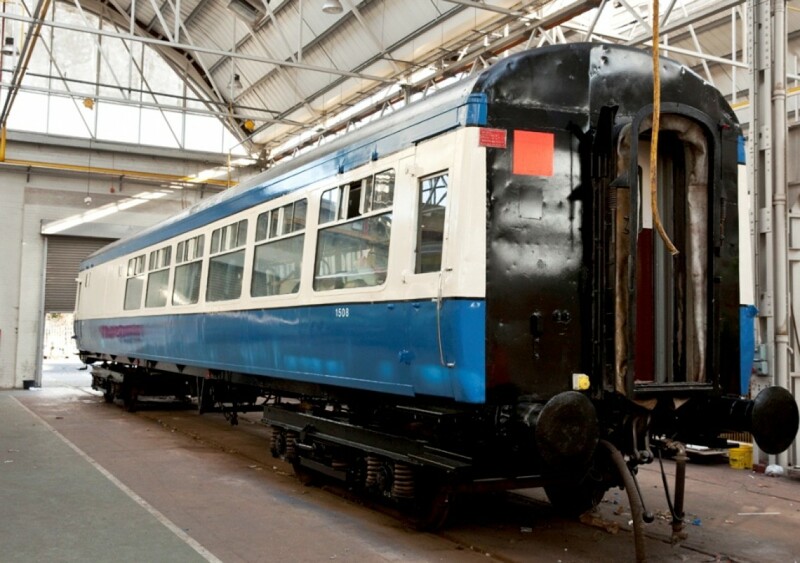 In 2012 the vehicle was taken out of traffic for proper restoration by our volunteers. The decades had not been kind to 1508 and her external panelling was in particular need of much TLC on one side. 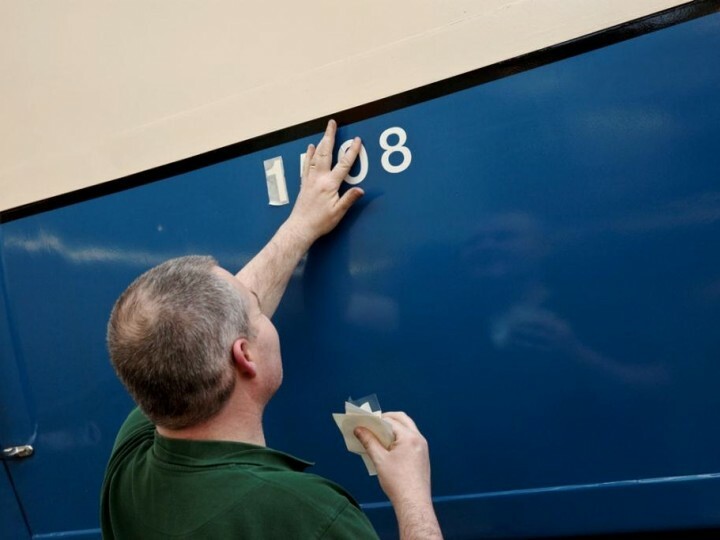 Since then, the exterior has gradually been repaired and the interior renovated, with a complete repaint internally from vestibule to ceiling. 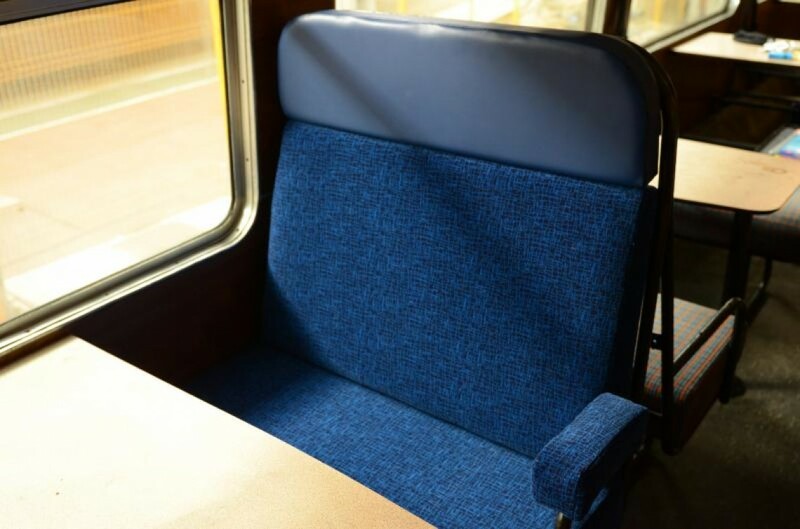 The seating is being reupholstered and it is hoped to finish her off in RPSI blue & cream livery very shortly, with a view to the carriage re-entering service during 2015 looking better than ever. This will also enable the return of the souvenir shop on our trains, thus generating extra revenue. 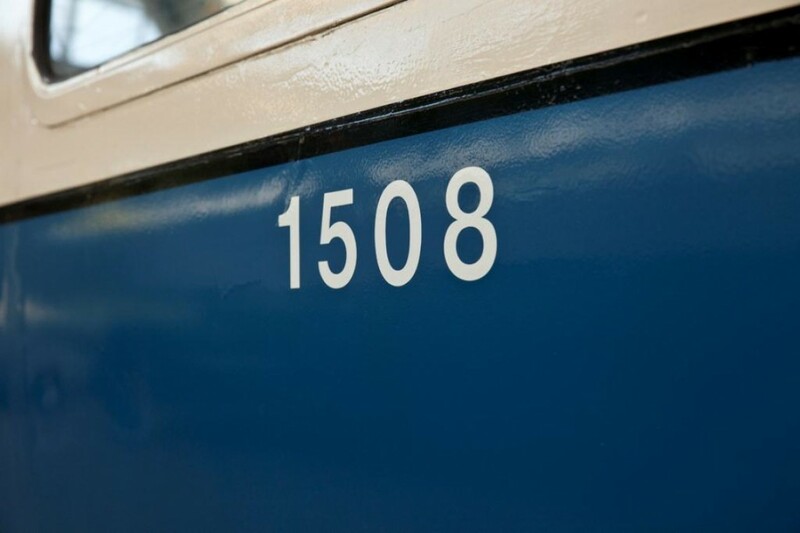 By early March 2015 1508 was in the final stages of completion, as well as the black lining 1508 was given her identity back in the form of her numbers. Other features including her fluorescent red safety squares and the overhead wires signs. Only a few exterior details remained, i.e. the Society's crest and the EVNs to identify the coach. 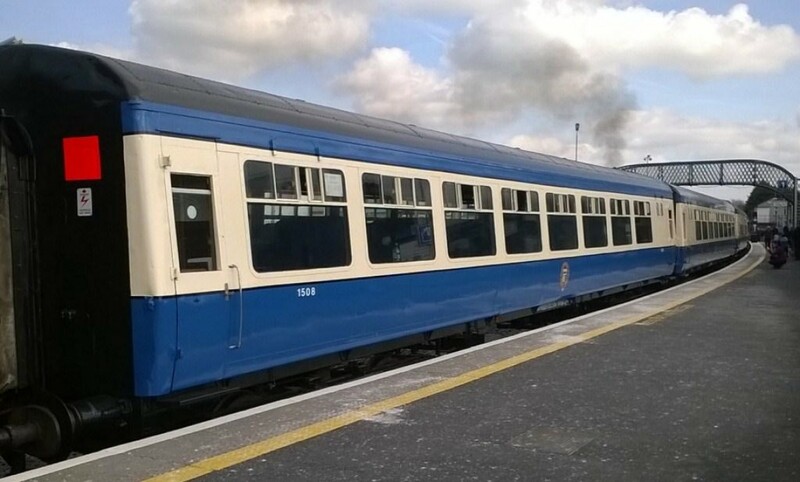 The carriage entered traffic again on the "Marble City" trip to Kilkenny on 22nd March 2015.